Two ministries with the same passion and goal have joined forces to help children hear the sweetest story ever told. 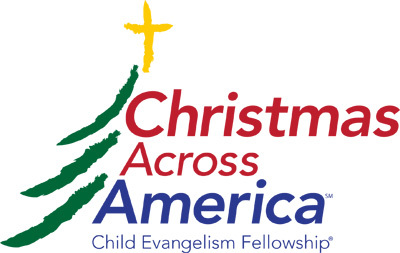 Child Evangelism Fellowship® and Jesus Film Project® are working together to bring the story of Christ to 100,000 children through the CEF Christmas Across America® (CAA) ministry. CAA equips individuals, churches and other organizations to host 90-minute Christmas Party Clubs to help children understand the true meaning of the holiday. Inside each Christmas Party kit will be 20 copies of the 67-minute DVD for children to share at home. Last year CEF held 2,559 Christmas Party Clubs all over the nation in homes, churches, restaurants, libraries and other locations, each featuring a Bible lesson, songs, snacks and games. Over 60,000 children attended the parties and about ten percent of them trusted Christ as Savior. Many adults were also impacted. Those children all took home a “Story of JESUS for Children” DVD. The parties are a fun and effective way to reach into a community, and the kit with all the teaching materials, training helps, music, promotional items and DVDs make it a simple project. The kits, available in both English and Spanish, are valued at $125, but are free to those who commit to teaching a party. For more information about Christmas Party Clubs, click here.